This machine fit for drying and sterilizing powder ,granular, sheet-like or gel-like food ,and additive, flavoring, medicine, raw material of herbal medicine, nutritional heaLDh products, agricuLDure & sideline products, non-fried(or oil-saving)instant noodles, noodles, rice powder noodles, soy products, beef jerky, preserved meat, dried fish ,tea, tobacco and so on; and for drying, peeling and baking almond, peach kernel, groundnut kernels, chestnut and so on; and for puffing of leisure food ,pachyrhizus chips, potato chips, dried shrimps, fish maw and so on; and for sterilizing and oral liquor, pickles, a variety of small packaging food ;and for drying beans; and for thawing the frozen fish ,pouLDry; and for drying and desulfurating and deoxidizing the metallurgical chemical products; and for drying printing and dyeing products, ceramics, glass, chemical fiber, cotton yarn, wood, leather, bamboo products, insulation materials, building materials, cork, alveolate cardboard, corrugated ,and so on. 1.The equipment adopt Panasonic magnetron,long life,best effect. 2.Adopt 304# stainless steel,compact structure ,no energy dissippation,save energy. 3.Tunnel type design.cover small area,fast drying and sterilizing,save energy. 4.Drying and sterilization st the same time. 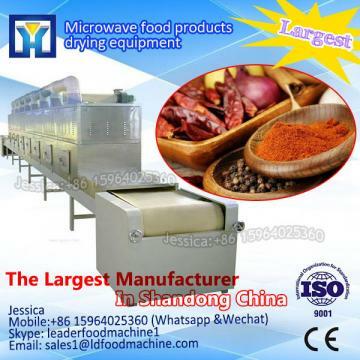 If you interesting in Panasonic magnetron save emergy microwave cookies dryer and sterilizer equipment ?kindly ask me, Shandong industrial microwave oven can give technical support and service.